Tommie likes to do a lot his way, even when it goes wrong. He is always in for a little prank, but really loves his friends Pino and Ieniemienie me will talk about in upcoming blogs. He mostly pranks the humans in the street. And he is always there to make everyone smile. Me love it that Tommie likes to invent things, but also to play dress up. He is very famous for his hats. He has his own way of saying things. Especially Poe Hee! (pronounced poo-hay) and Hotseflots (hot-suf-lots) are his favourites. The first is a way to express himself when he is really impressed and the second is used when he has invented something cool or is finished with something. Me like Tommie and his friends. On Youtube you can watch Tommie and his friends. 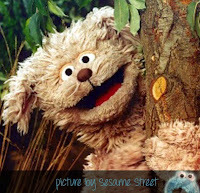 Make sure to search for Tommie and Sesamstraat and enjoy Dutch Sesame Street!